Atomik RC is proud to offer a new standard in power, performance, and reliability with the new Atomik Red 120 Amp Sensored Brushless ESC with 550 7.5T Sensored Brushless Motor Combo. This sensor-based brushless combo is designed for the rigors of electric 1/10th vehicles including 4WD short course trucks and rock crawlers. This combo is the perfect upgrade for most 1/10th RC vehicles that include Traxxas models: Slash 4×4, Telluride, Rustler, Stampede, Associated models: Prolite 4×4, SC10 4×4, Losi TEN-SCTE and the Team Durango DESC410. High quality features include 12 AWG Soft and Flexible Low Resistance Silicone Wire leads, pre-installed EC3 battery connector, and included 200mm sensor wire. In the event of sensor wire failure the Atomik Red 120 Amp Sensored Brushless ESC with 550 7.5T Sensored Brushless Motor Combo makes a seamless transition to sensorless mode, keeping you in the race. Included Components: 13025 – Atomik Red 120 Amp Brushless Sensored ESC. 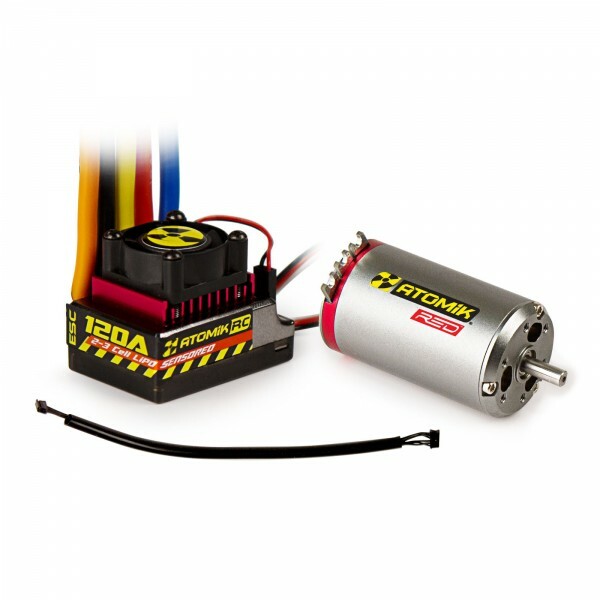 13019 – Atomik Red 550 7.5T Sensored Brushless Motor. 13021 – Atomik 120 Amp ESC Sensor Wire – 200mm. ESC Features: Fully Programmable, 3 Running Modes (Race Mode, Basher Mode, and Crawler Mode), Adjustable Timing and Start Modes, Low Voltage and Thermal Protection, Cooling Fan Included.